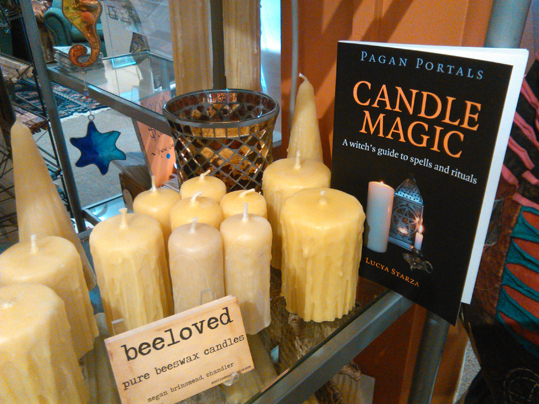 My book Pagan Portals - Candle Magic has reached Australia! Here is a photo of a copy of it on the shelves of Seppenfelts, 13 - 15 Emu Bay Road, Deloraine, Tasmania, 7304, Australia. Seppenfelts is run by Isabel and Alfred, who I met at the Druid Camp this summer. Their shop sounds lovely and I hope I will one day be able to visit it. Isabel put my book next to candles made by a creative chandler Megan, who makes "beeloved candles" with pure, organic, locally sourced beeswax. Well look at you go! I love all the Pagan Portals books. I'll be adding yours to my list!